Laura Pursell’s Somewhere in this Room is too beautiful to be categorized as Adult Contemporary. Given that the genre has embodied too much cheese the past couple of decades, laying the Adult Contemporary tag on this meticuously crafted and classically arranged project is too superficial. The first five or so minutes of Somewhere in this Room, the opening “Overture,” is a sweeping instrumental piece that’ll leave you breathless and in awe with its waves of lush violins and evocative piano. Pursell doesn’t even sing on it; it isn’t until the second track, “When You Come Down,” that Pursell is introduced, seducing us with a fragile voice as sweet and warm as Karen Carpenter’s in her prime. From “Overture” you get the impression that Pursell will pursue chamber-pop on the rest of the CD. Not at all. Pursell veers from the bluesy regrets of “Not Much to Lose” to the bossa nova charms of “When You Smile” to the orchestral masterpiece that is the title cut. Producer Andrew Bonime does an outstanding job of keeping the record consistent even when Pursell strays from one genre to the other. The album is not meant to be sliced into pieces on an iPod; it must be experienced from beginning to end, letting its various parts melt into each other to produce a massively satisfying and hauntingly pretty whole. Somewhere in this Room is nothing less than a work of art. Spring is here, and so is the bright, bouncy, and buoyant new album from Kinderjazz. Let the sunshine in because that’s what Kinderjazz is all about. 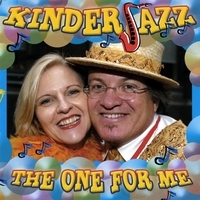 As hinted by their name, Kinderjazz are a kid-friendly Big Band from Australia. The group has numerous members – enough to crowd a house, that’s for sure – that are highly skilled musicians performing music which will appeal to the child in anyone. Because they are aiming for the kiddie market, they might not be taken as seriously, most likely unfairly dismissed as a novelty act. No, not at all. Kinderjazz are simply taking styles of music often targeted towards grown-ups and wrapping them up in the most delectable bubblegum. The One for Me consists of original material that may sound like songs from more than 40 years ago. Again, the difference is Kinderjazz’s approach, producing tunes that tykes can boogie to without the influence of purple dinosaurs. “Kinderjazz” and “That’s Fine” steal our hearts from the very beginning, percolating with giddy Latin rhythms; I love how the former runs into a smashing, crashing conclusion. The energy on The One for Me will leave you – and your children – breathless. The band never seems to tire, leaping from swing to jazz to funk with the open-minded and wild imaginations of – guess what? – kids.